When I first started teaching, I was nervous to teach the kids to count and add with base 10 blocks. I have no clue why! But once I dug my feet in, and saw how fast they can learn math concepts using these blocks, they won me over. Not to mention it's a standard and important foundational skill to understand how to add and regroup. 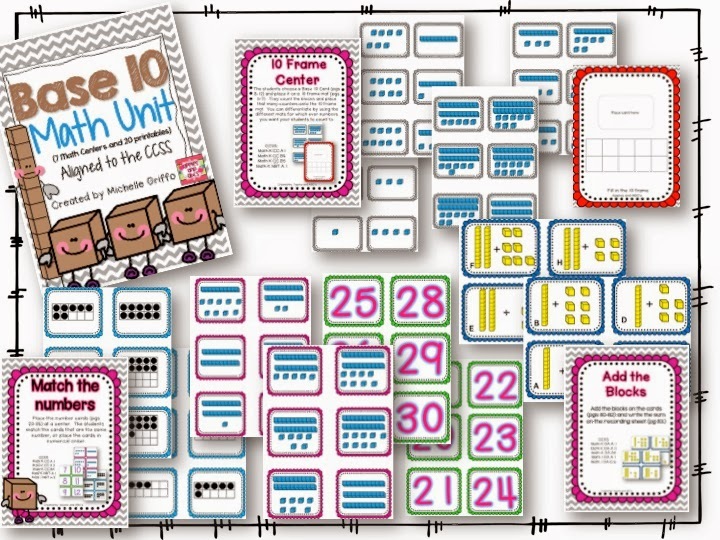 The students pick a card, and fill in the 10-30 frame mat with counters. I incorporated some emergent readers for math so we could practice our sight words WHILE counting! My Common Core team loved this example of extending literacy into math. Here is a basic count and write the number center. It is challenging teaching kinder, when some kids are still counting to 30 and others are ready to add. I have both options in this pack so you can differentiate your math centers. Here is the addition center, they add the blocks and record their answer. This is a more challenging math center. The students have to write how many MORE blocks they need to get a sum of 10. 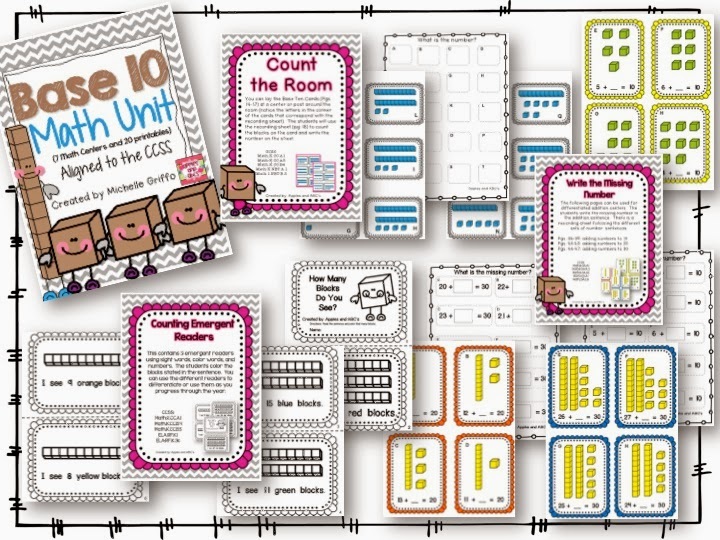 I made cards with sums to 10, 20, and 30 so you can level your math centers. I placed this math center out for the kids to play with once they finished their work. They matched all of the cards with the same number. At different parts of the week, I gave them just one set, and they had to place the cards in numerical order. 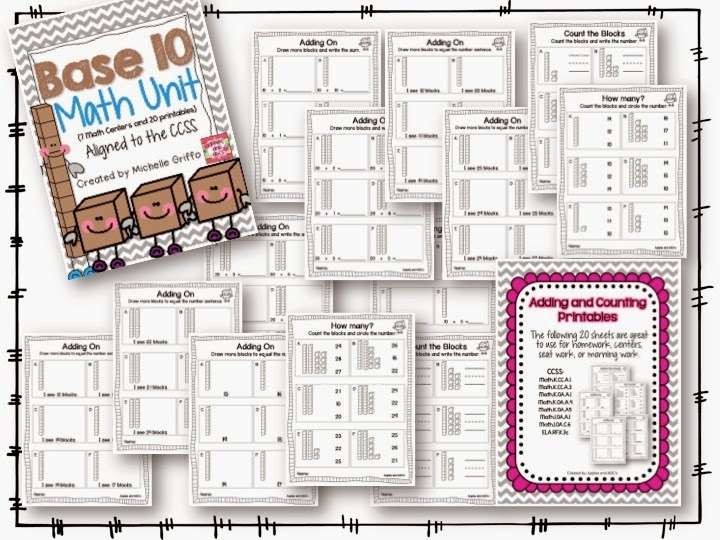 The Base 10 Math Unit has 20 printables for you to use during morning work, homework, centers, or for independent practice. The kids LOVED the variation on the sheets, and I could also differentiate among my learners. WOW! I LOVE this :) Can't wait to get it for my firsties! I homeschool my 3 kiddos and they will love this set....putting it on my TpT wishlist. Thanks so much! This is EXACTLY what I need for a small group of my kiddos that are still not grasping base ten blocks! Thank you for sharing! IPMG Publishing participates in the Apple Educational Discount Program. If you have an iPad program or a ‘suggested apps for parents’ program, it would be wonderful if you would consider including Tic Tac Math. Thank you so much for all that you do for kids and for considering our apps!